The ability to be able to turn your mind off and have a break is a tough skill to crack. How long does it take you to completely unwind on holiday and come back feeling refreshed? Is there something you can be doing to help speed up that process, or make it happen in a much shorter time frame? In a previous blog post I started to talk about mindfulness and visualization – both great ways to achieve this. This blog post is more about doing something entirely for you. It’s about self-awareness and taking the time to do what you love. The gang! My brothers. Wet and sandy! I first tried surfing at the age of 6. We were on a family holiday in Cornwall. Of course, being by the sea, on the North coast and being the type of child who absolutely loves anything to do with water, I wanted to go bodyboarding! It wasn’t like sailing for me, I didn’t fall in love and want to do it every waking moment… with sailing it was the love combined with the thrill of competition and getting better at something always eating at me, pushing me to be better. Riding the waves was just about fun. Feeling a little out of my comfort zone, getting pushed around by the ocean, flying down a wave with my brothers next to me laughing. I didn’t carry on surfing very much at all, just the odd bodyboarding session each summer. 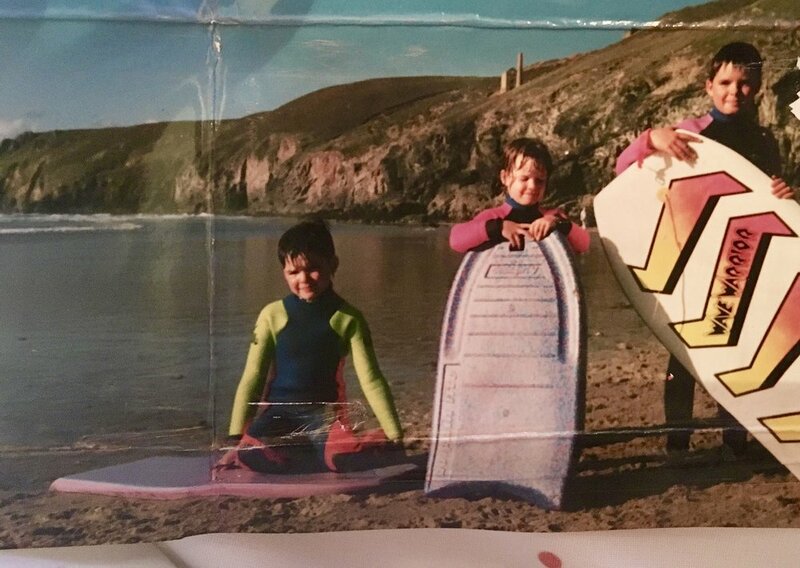 I tried ‘proper’ surfing – the stand up variety, when I was about 12, again in Cornwall. It was hard! We made the usual mistakes – board too short and not wide enough, so it would basically sink when you sat on it. It was about looking ‘cool’ carrying your board down the beach, more than actually being able to surf! Han and Peggy - The Algarve Surf School and Camp! Han and Peggy! Potentially too cold to surf! After we finished school, having not surfed for quite a number of years, one of my closest friends (Peggy) went out to Lagos, Portugal to work for Algarve Surf School and Camp. It was on my trips visiting her that I finally did enough surfing to be able to dare I say it - do it! I could stand up on the green waves! And RIDE ALONG AN OPEN FACE! I can’t even describe how good that feels. Yeah, so I was on a 8ft foam board, but it just didn’t matter! The feeling was incredible! It’s safe to say, I didn’t become a pro surfer…but I did fall in love with a new sport. And for once, it wasn’t anything to do with competition. It was everything else. The battle against the ocean, trying to paddle out when you constantly get knocked back towards the shore, the sound of the sea, the noise of the waves... sitting there waiting for a set of waves to come through with nothing else on your mind other than where you should position yourself. Love love love the Ocean. I realized I had found something that completely and utterly, 100% took me away from the world. It was just me, the sea, and surfing. Before the London 2012 Olympics I was exhausted and fairly stressed. It had been the most manic 18 months of my life building up to London, and I hadn’t had time to stop and switch off properly. I knew that if I didn’t take just a couple of days out before the Olympics, I would burn out half way through the week. About a month before it began, I headed out to visit Peggy in Lagos and we spent 4 amazing days finding mellow fun waves to surf, which allowed me to totally tune out. I went home feeling more refreshed than I could remember and focussed on what was ahead of me. Usually it takes at least a week for me to properly unwind from things when I’m on holiday, so to do it in 4 days was not only great fun, but also very useful! Before Rio time was a little bit tougher to find, as we were back and forth out there a lot, so travelling to Portugal wasn’t ideal. However, I made the time to get down to Cornwall for a couple of days, get out on the water and give my mind the time it needed to forget about everything. Even when I was under the most immense pressure; nervous, excited and anxious, I could go out, sit around out back for a while, catch a few waves and come in having forgotten that the Olympic Games was starting in a few weeks time! It's always worth the faff of putting a wetsuit on to get in the sea! Surfing for me isn’t about being the best, it’s not about catching big waves and beating everyone around me. It’s a way to relax. It is addictive, but also something everyone should have. What is your ‘surfing’? What is your way of taking yourself away from everything, and doing something which is 100% for you…if you don’t already know, I challenge you to find it.